Madagascar The Musical opened with a bang last night at New Wimbledon Theatre. Based on the DreamWorks 2005 movie it is the newest family musical to hit the stage. The show tells of Alex the lion, Marty the zebra, Melman the giraffe and Gloria the hippo. A group of friends who, at the start of the show, are living in Central Park Zoo. Marty however decides he wants to see the wild and when he escapes his friends go after him. Their journey however is far from straightforward and thanks to a group of pesky penguins they end up marooned in Madagascar. The show is pitched brilliantly at its desired audience. It is visually exciting with a simple enough story for the children to follow yet there are enough knowing jokes in the show to keep the adults happy. Part of the excitement for the children and adults alike is the costumes and puppetry used to portray all of the various animals. 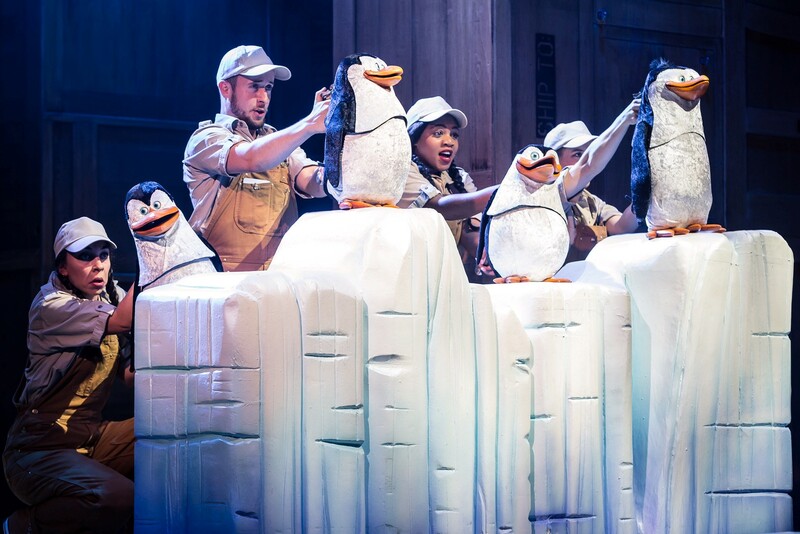 There is a huge variety of techniques used within the show with our 4 main characters being in brilliantly designed skins (although Melman have a clever puppetry element for his neck), King Julian is hilariously designed more Lord Farquad style on his knees and the penguins and other physically smaller characters are puppets. The cast cope with the variety nicely and plaudits should be given to both the costume and puppetry team on the overall design of the show. All of the characters are instantly likeable. Matt Terry as Alex the Lion is the personification of cheeky chap who genuinely looks like he is having the time of his life on stage. He not only has the voice but the moves and the physicality for this role. Antione Murray-Straughan played Marty and even in a zebra costume he busts out some brilliant dance moves. He reminds me a lot of donkey from Shrek with the loveable, crazy personality and can see a lot of children going home saying that Marty was their favourite. Jamie-Lee Morgan as the introverted, hypochondriac Melman and Timmika Ramsay as the loud and proud Gloria are comedy gold, playing off each other nicely. It was however Jo Parsons’ King Julian that brought the house down from his first entrance. He has some of the best one liners in the show and delivers them to perfection. The range of character traits means that there really is a character for each child to identify with and that is part of the charm of the show. The songs are fun however admittedly they don’t stay in your head. The one huge exception to this, that is of course ‘Move It.’ This number had the children in the audience shrieking with joy and even the adults in the audience were singing along. The choreography was clever as Fabian Aloise had worked in flossing and dabbing to the impressive dance breaks in the number. This is perfect timing for this show to begin it’s tour as it is great entertainment for both children and children at heart. 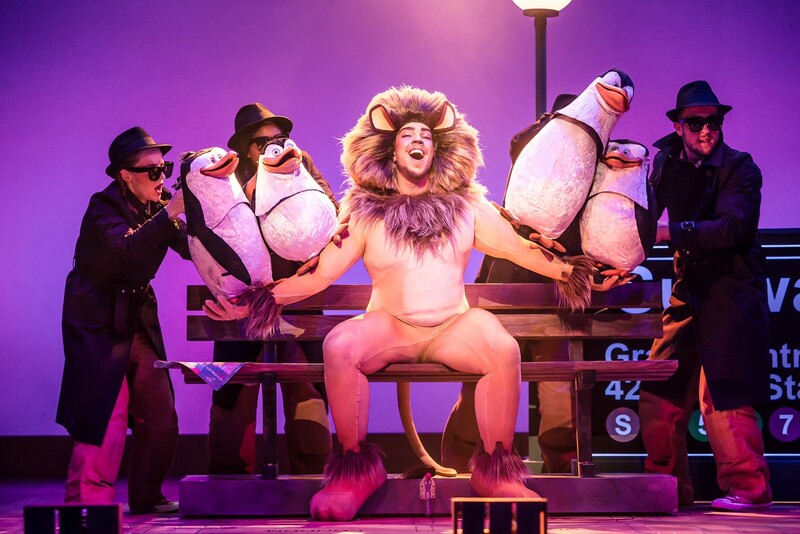 With a nice moral compass to the story, an interesting and vibrant design and spot on choreography you really need to ‘move it’ to get to see Madagascar The Musical. 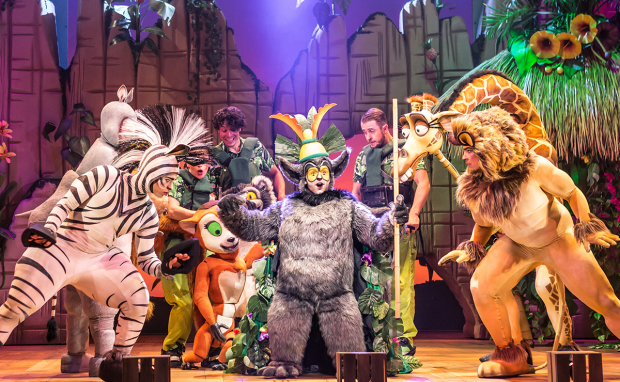 Madagascar The Musical is playing until Saturday 28th July when it then continues its tour. Visit their website for tickets and more info on the rest of the tour. If you like this review you might also like my review of School of Rock, Matilda and Gifford’s Circus.